Is my plantar fasciitis spreading up my leg? Is my plantar fasciitis spreading up my leg ? the front of the shin bone to the midpoint of the inside edge of the arch (shown above at X) to reduce pressure on the fascia. The muscle gets overworked by trying to create an unusual method of walking and this can result in pain in either of these areas. The same thing could well happen for any painful foot problem, such as standing on a piece of glass and can affect you all the way up the leg, knee, hip, back etc. The podiatrist can address these secondary problems too, but obviously the underlying cause needs to be sorted out. 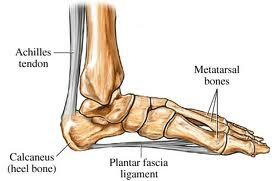 For more information, please browse to our Plantar Fasciitis Info Sheet. Alternatively, click the following link to return to the Podiatry FAQs Blog.